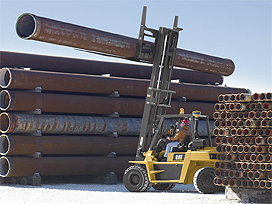 The DP70E was built for harsh, rugged material handling applications, without sacrificing operator comfort or convenience. The automatic transmission and high-stall torque converter offer precision inching and smooth acceleration. With an auto-shift feature that shifts gears up or down based on travel speed, this forklift helps simplify operations while enhancing productivity.